Bhagavad Gita Art Gallery--Plate 17: "In order to deliver the pious and to annihilate the miscreants...". 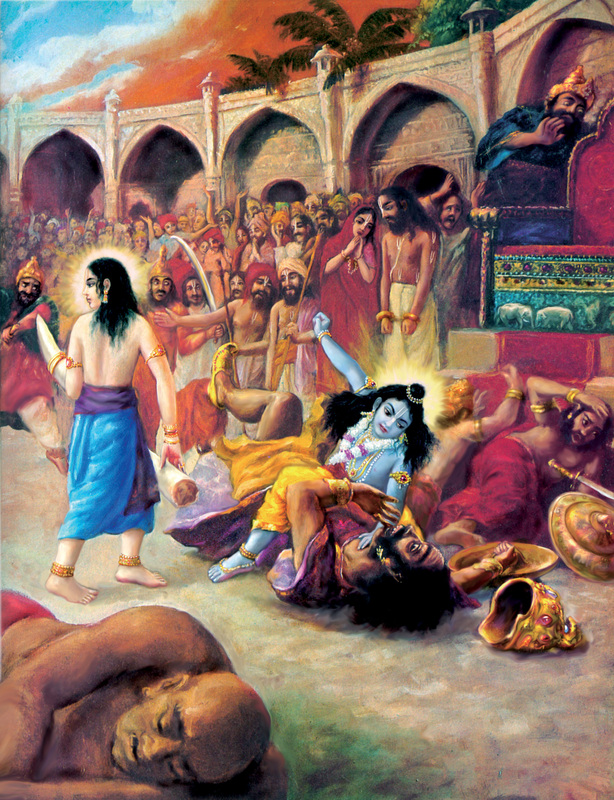 "In order to deliver the pious and to annihilate the miscreants..."
PREVIOUS Bhagavad-gita 4.8 Krsna's uncle, Kamsa, is being killed by the Lord, Balarama, Krsna's brother, is standing on Krsna's right. Behind Krsna are His parents, Devaki and Vasudeva, who were imprisoned by Kamsa but are here freed by their son. This scene takes place in Kamsa's wrestling arena in Mathura province.